Listening music is one the of best ways to relax mind and nourish weary soul. It’s common to see that people listening music at leisure time via mobile devices such as iPhone, Samsung Galaxy phones and etc. If you have used iPhone for a long time but now turned to Android phone, you must need to transfer all your favorite music, audio recordings etc. from iPhone to your new Android like Samsung Galaxy S8/S8+. If you have no idea about it, the guide would be very helpful to you. Gihosoft Mobile Data Transfer software can help you transferring music files from iPhone/iPod to Android phones such as Samsung Galaxy S7/S7 Edge/S8/S8+, HTC One A9/M9 or etc. in a click without any loss in tone quality. By using it, you can even transfer more iPhone data to Android such as SMS, contacts, photos, videos and calendar in a breeze. How to Transfer Music from iPhone to Android Without iTunes? It’s free to download Gihosoft Mobile Transfer to evaluate its features and functions. Please download and install the correct version on your computer. Then you can start transferring music from iPhone or iPod to any Android mobile phone. Launch the Phone Transfer tool and tap the “Phone to Phone” section. Then connect your iPhone and Android phone such as Samsung Galaxy S7/S8 to computer through USB cable. After the two phones have been connected, the phone name will be showed on software interface, just as the following screenshot shows. Please tick on “Music” to make it selected. If you need to transfer more files by the way, please select the file types according to your practical need. Please hit “Start Copy” and then the software will do all the rest work at high speed. The process will cost a while that it depends on the music file quantity stored on your iPhone. A progress bar will show you that how many songs have been successfully transferred and how many files are pending. Once the program has finished transferring music files from iPhone to Android like Samsung Galaxy S7/S8, please go to music option to check all the songs. 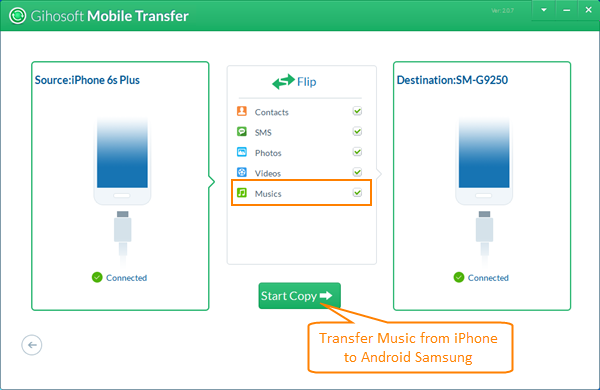 If you need to transfer music from iTunes to Android, please follow the guide.